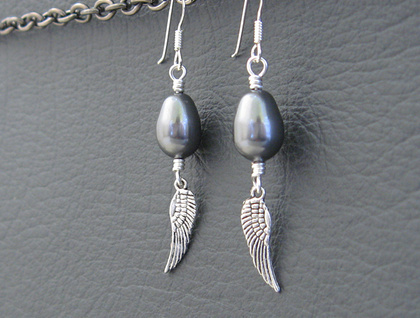 Tiny, antiqued-silver coloured angel-wings dangle beneath stormy, dark grey Swarovski pearls. 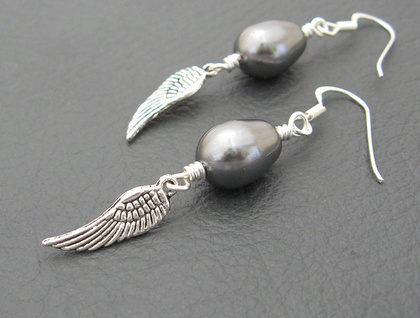 The pearls are wire-wrapped with silver coloured, non-tarnish artistic wire, and hang from sterling silver ear hooks. Swarovski pearls have a crystal core that simulates the weight and feel of a real pearl. They are fade- and perfume-resistant, with a luxuriously smooth, flawless finish; and are generally regarded as the best imitation pearls on the market. 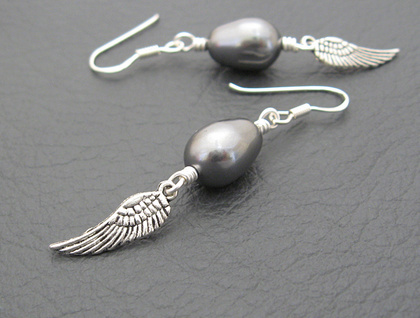 The pearls in these earrings are egg-shaped, and are a deep, evocative blue-grey in colour, like storm clouds. The elegantly shaped ear-hooks are from Thailand, and are stamped 925, indicating that they are sterling silver – that is, they contain at least 92.5 per cent silver. Most people with metal allergies can wear sterling silver, even if they cannot wear any other metal. 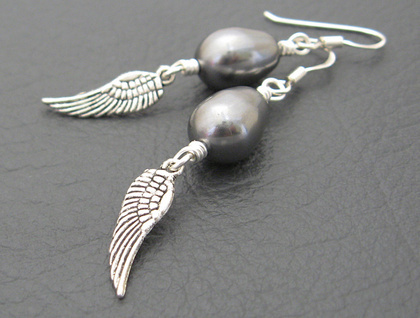 The 'Storm-angel' earrings measure 50mm from top to bottom. From the bottom of the ear hooks, they measure 37mm, while the angel wing charms are 17mm long, including the baile (hanging loop).